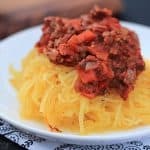 Cook your [Spaghetti Squash Noodles | https://www.joyfulhealthyeats.com/how-to-cook-spaghetti-squash/]. In the meantime, heat a large skillet to medium high heat. Add coconut oil, once melted add small diced onions. Saute for 10 minutes, until slightly caramelized. Add minced garlic cloves, saute for 30 seconds. Add diced carrots and strips of diced bacon. Saute for 5-7 minutes. Add in lean ground beef and cook until no more pink, about 6-8 minutes. Add in basil, oregano, parsley, thyme, ground cinnamon, salt & pepper. Stir to combine everything. Add in crushed tomatoes and diced tomatoes. Bring to a boil and simmer for 15-20 minutes to let all the flavors combine. Serve over Spaghetti Squash Noodles.